Message in a bottle: Food, or not? Etsy is much more than a marketplace, it is a world where you can find almost everything!! 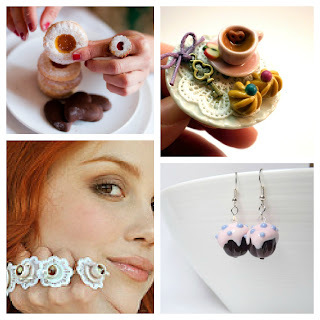 Miniature of food used as earrings, rings, brooch, etc... are very popular, not only on Etsy! What I personally adore are those miniatures where you could mistake them for real food and even eat them. Chiara sends her beautiful pieces from Bologna! Her pictures are really funny, and she knows how to make her customer hungry, for sure. In her shop you can find any kind of pastries! Entering her shop is like entering a real kitchen!! Cristina does much more than food miniature, her jewels are fun and cool, and dreamy and... many much more!! She is a real artist in what she does! Her shop deserves more than a look! Paola has a particular retrò style that make her jewels extraordinarly fine! You could think that she is a very British lady, but she is not. Particularly skilled in cups of tea, she lives in the north of Italy, while her origin are from the south. Let's have a cup of tea with her! What are you waiting for? Go and see her incredible art!! That's about four particular crafter that I have found on etsy, of course if you go directly into the cauldron you can find even more!! I like food jewellery, and I made a particular present for a friend of mine through etsy, a tray of biscuits! She really appreciate it, it is the kind of thing you can wear to go to work or to go out at night. Something that make your style more personal! And that made my present surely personal! 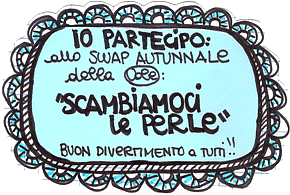 Grazie Clode, un post bellissimo, sono commossa! Thanks so much, I love this post! You gave me the right inspiration! !